"How Far From Home Are We?" Photos and update! There is something magical about having a vision of something for a long time and then coaxing and birthing this vision into reality. This is how I felt with the recent collaborative exhibition, "How Far From Home Are We?" 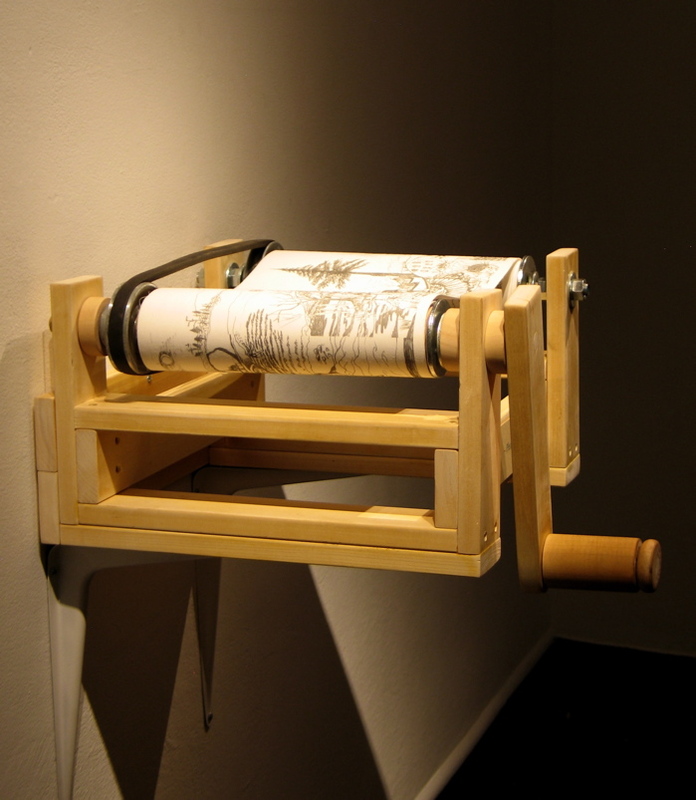 that has been/will be installed for the month of April at the Harwood Arts Center in Albuquerque. The process of bringing this show into the world was more magical because it was all done with my project collaborators Anna and Becky in the UK. The show took shape over the course of months through flurries of emails, reports and reponses. And then I manifested our vision at the Harwood with the indispensable help of my husband Chris and my friend Aimee Deans. It all started over two years ago when I applied to have a show of "How Far From Home Are We?" 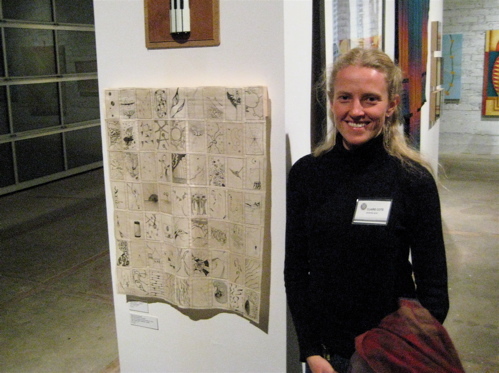 at the Harwood Art Center in 2009. At the time, Chris and I were still in New Zealand and the dates for the show seemed far off. And they got moved from that fall to the next fall and then to the Spring of 2011. 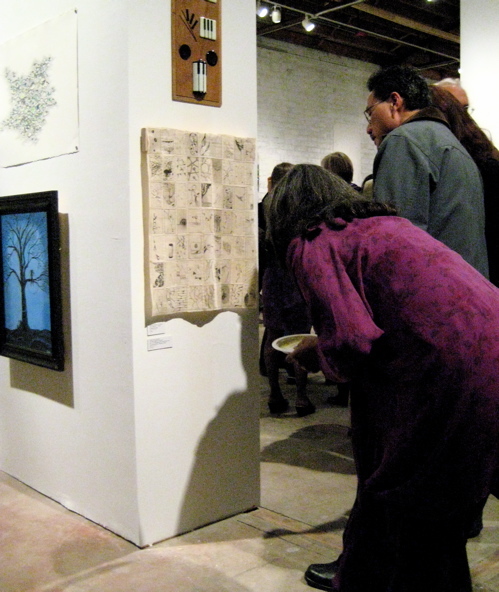 So this show was a long time coming and it is wonderful to see the vision and the many experiences of the journey that the show comes from in a new form at the Harwood Art Center in Albuquerque! 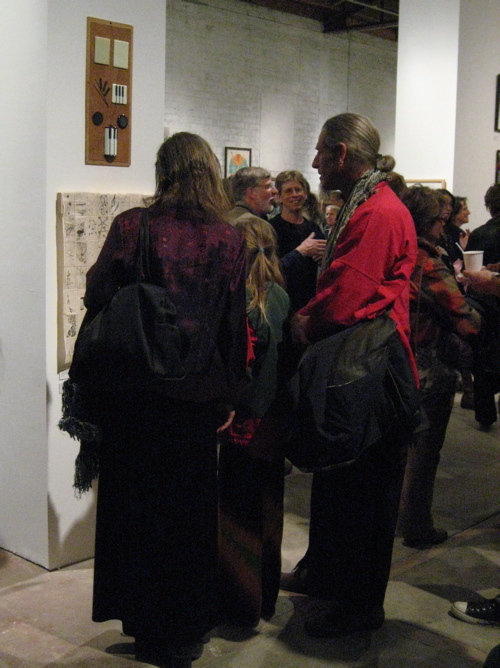 Peruse images of the show and opening here. Check out images of my "Sounds Surround Workshop" here. Read about the exhibition in the Taos News here. The project website is howfarfromhomearewe.com We'd love to have your feedback on the show!! Making its debut in the United States, this exhibition is the collaborative outcome of a voyage in a small van from Totnes England to Helsinki Finland via the Baltic States and back through Scandinavia, across 16 borders, over 5,700 kilometers and all in seventeen days. 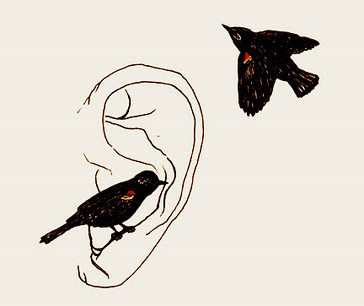 On-site recordings and creative reflection are woven together to provide illuminating glimpses of a journey by land and sea. 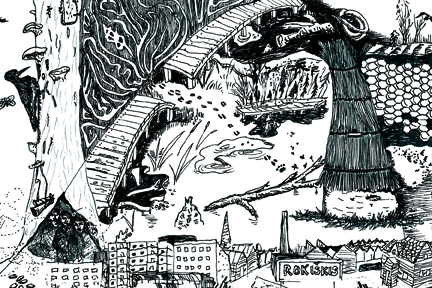 Collaborative pen and ink drawings created over bumpy roads and by the light of headlamps offer illustrated glimpses. Whittled tally-sticks provide a sculptural “account” of the expedition. 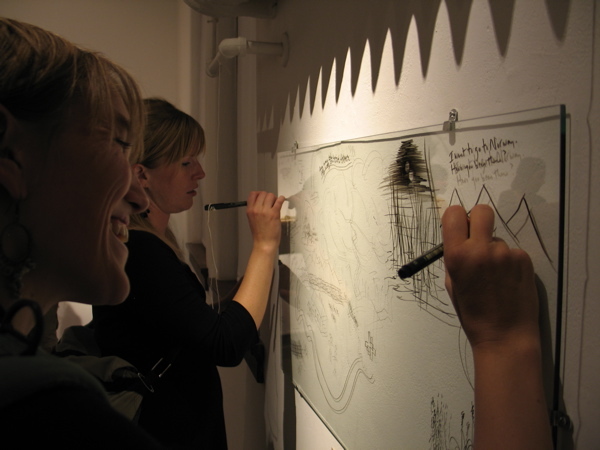 Come and experience this intimate multi-sensory journey and join the collaboration through listening, smelling and drawing! Dates pending for broadcasts of this radio journey on Sound Art Radio 102.5 fm, Totnes, England and KRZA Radio 88.7 fm , Alamosa CO. / Taos, NM. Check our website below of updates and live streaming opportunities! 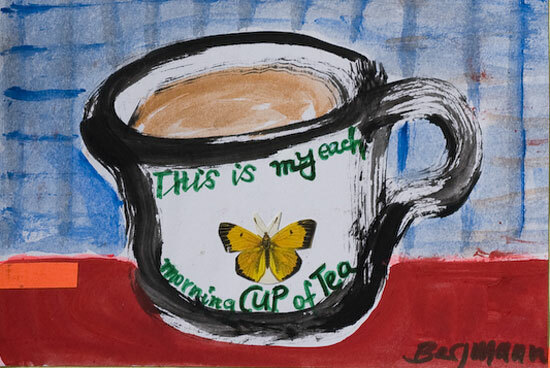 Mail Art Call "My everyday object"
This is an interesting exhibition opportunity, in which I plan to participate. I invite you to join me! The deadline is coming up fast - March 31, 2011! Name: Polifemo Fotografia E-mail address: polifemo.news@gmail.com Homepage URL: http://www.polifemo.org/ The Exhibition will take place in Milan, on the occasion of Salone Internazionale del Mobile from April 12, 2011 through April 17, 2011. La Fabbrica del Vapore, a center especially devoted to the youth's cultural productionand belonging to the Milan City Council, is house to several associations promoting many activities aimed at young people.The 50° Salone Internazionale del Mobile involves the city of Milan, providing an opportunity to continue a reflection on design, on creativity and on culture.Polifemo, a cultural association working inside La Fabbrica del Vapore, wants to reflect on the usage of everyday objects by creating a great international mail-art-exhibition held inside its space on the occasion of the Salone Internazionale del Mobile. Join us! Feel free to forward this Mail Art Call! Join us to "Follow The Money" this Saturday! When: Saturday, February 26th 11:30 a.m. This event is created by newly formed NACFR, The National Association for Campaign Finance Reform. NACFR is a project initiated by a group of artists, activists and concerned citizens eager to fulfil their civic duties through supporting and encouraging all Governors and members of Congress in their quest for transparency through events performances and art exhibitions. Learn more at nacfr.org. NACFR agrees with Susana Martinez that, “Only bold change will end rampant abuse in state government,” (9/15/10 NMPolitics.net). And we know it’s hard, so we’re here to help! ‘Follow the Money’ is the first in a series of local and national events staged by NACFR to encourage and support our political representatives’ commitment to transparency. 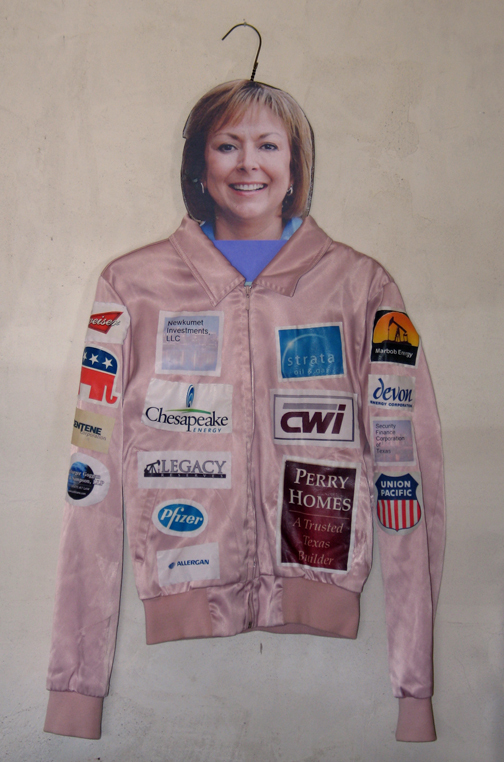 On Saturday, Feb. 26th join NACFR’s own “Governor Susana Martinez” for a rare press conference and Follow the Money, patch by patch on her new official, state NACFR jacket, emblazoned with her sponsors, who coughed up cash for her election campaign. She will be flanked by her pit crew, TEAM Martinez, representing Oil and Gas industries, Dairy and Ranch industries, and Medical and Pharmaceutical companies, just to name a few. “The Governor” will also applaud the US Supreme Court’s 2010 ruling, Citizens United v. Federal Election Commission, blocking bans on corporate political spending and reaffirming corporate personhood (Dartmouth College v. Woodward, 1819 and Santa Clara County v. Southern Pacific Railroad, 1886). All of this is in the spirit of civil-minded transparency so YOU the voter can decide whose interests are being represented in the Round House. Hope to see you on Saturday at the Round House in Santa Fe! 18 Days Opening - wow! 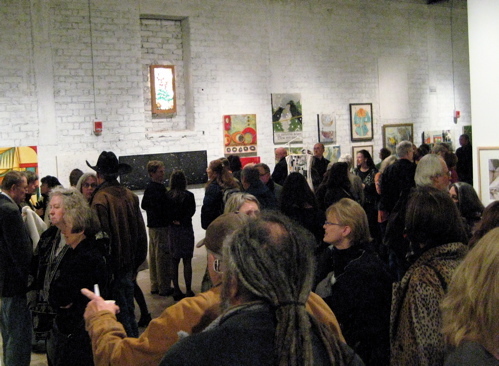 The 18 Days opening was absolutely packed with art enthusiasts, both exhibitors and the general public. As we drove up to the CCA, I found myself wondering if there was a big event happening at the nearby church or the Children's museum (there were cars overflowing out of the parking lots onto the shoulders of Old Pecos Trail). All too soon, as we tried to find a parking place at the CCA, we discovered it was all for the 18 Days opening reception. The work was varied and interesting with a wide variety of subject matter encompassed mostly by painting, prints, and drawing but also by photography, fiber, video, installation, welding, and "upcycled" fashion. All work was mounted on the wall, except for a select 3-4 piece,s which were suspended from the high ceiling. My piece is tucked on the west end of a free-standing wall near the back of the gallery. My favorite aspect of the opening (besides getting to talk with lovely people of course!) was having the opportunity to observe people to peering at my piece, leaning in close to examine its many small squares stitched together. If you're in the Santa Fe area before March 20th, I recommend a visit. It is a show worth seeing and not just because my piece made the cut! Click here for a little promo article from the Santa Fe Reporter. 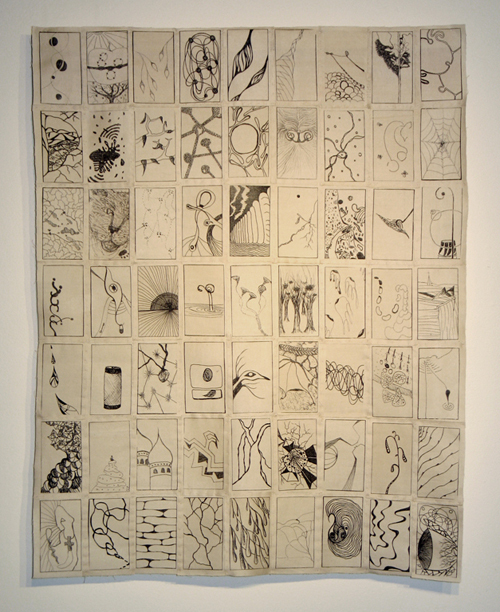 I am happy to announce that my piece, "63 Daily Nested Thoughts", pictured above, has been chosen to be included in "18 Days" Fine Arts Exhibition and Performing Arts Event at the CCA in Santa Fe. Visit my portfolio to learn more about my "Daily Nested Thoughts" series. Please join me and other selected New Mexico women artists for the opening of "18 Days" this coming Friday, (tomorrow) February 11th, 5:30 - 8:00 pm at the Munos Waxman Gallery at the Center for Contemporary Arts, 1050 Old Pecos Trail in Santa Fe. More information can be found at ccasantafe.org. The Exhibition runs February 11th through March 20th at the The Munos Maxman Gallery. The Gallery will be open Fridays and Saturdays 12-5 and Sundays 12-4 during that time. If you can't make the opening, hope that you can stop by the exhibition in the next six weeks.